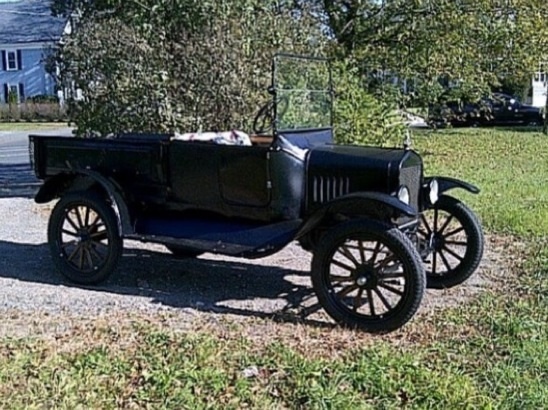 I recently purchased this 1922 Pickup with what appears to be an original aftermarket body. It has no name plate. Can anyone help me to determine the original manufacturer? I will try to send more photos but I need to figure out how to reduce them. Appears that the all-wood body is a home-built rig on a factory cowl section that was cut down. Seat back appears sawed to that shape, can't see any irons or supports that can be attributed to a commercially built body. Plus the buckboard style, seems more home made. Windshield frame is short too. The earlier white painted T under the covers also appears to be a home built wood body too. Probably a cut-off Touring Car. The low steel firewall is '23 model year only. Appears to be the lower half of the windshield, and that style was used early in the model year. Other features I see (spring, wishbone, wheels, fenders, crankcase) all fit with '23. I have an early '23 touring car and other than this car having a steel firewall (that began in March of 1923) it would be the same as my '23. 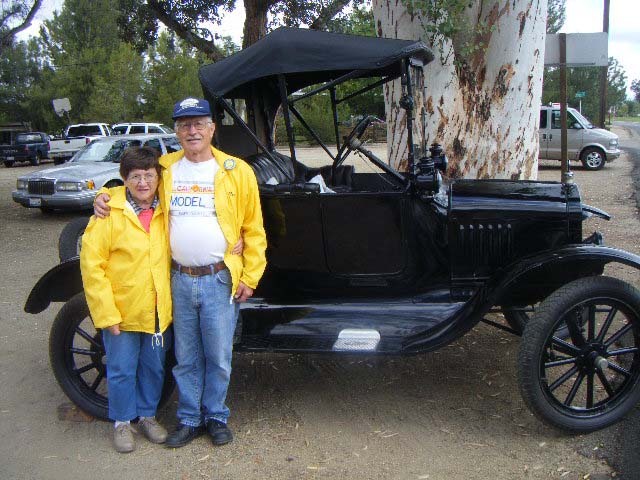 I agree with Dan and Mike that it is most likely a 1923 vehicle that has been cut down and a home made body fitted to it. I suspect more home made buckboards were built than any made by aftermarket factories. This based upon surviving examples found. One thing though - all Model T's have the same amount of fun built into them as standard equipment so nothing missing in the fun department. My first inclination from what I can see in the picture is that it may have been built in the 50's or 60's. Not knowing the history of it I may be totally wrong. I'm just assuming that from what I have seen. It would have had to have been stored inside in a dry climate for the wood to have stayed that good. The Speedster behind it looks made-up also. They both however could be a whole lot of fun. Everything from the cowl forward matches my 22 Roadster including the steel firewall. Mine has a low radiator and straight windshield. Mine is registered as a 22. I have seen 22's with the slant windshield too. The year 22 and 23 seem to be a time of transition. Maybe one assembly plant used a new part earlier than another one, or maybe over the years some parts have been swapped. Gentlemen. Thank you for the help and details. The body is clearly "factory" or shop built. Not homemade. The other photos are too large to get in yet and I have yet to figure out out to reduce them. Any help here would be appreciated also. There is no clear evidence to me of a cut down cowl. 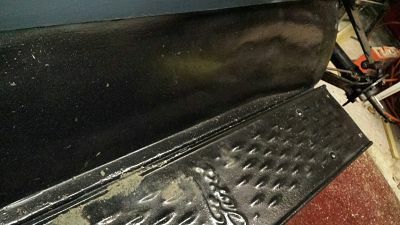 The other photos could show the irons and other evidence that makes me believe that it is factory type built. The engine number is October '22. Does that make it a '22 or a '23? The front fenders made me believe it to be a '22 as they do not have the lower lip at the frame/radiator. Is that correct? And oh yea, the amount of fun is immeasurable. Thanks again. I will continue to work on getting the photos sized down. Enjoy your new Ford! You will have fun. 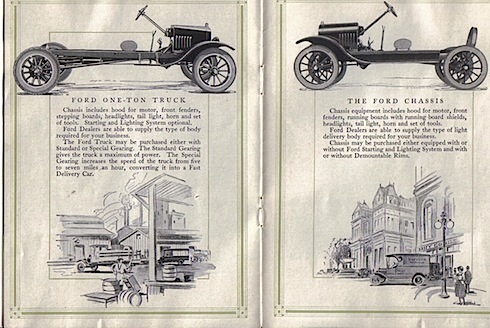 As for researching, this website will provide lots of info on commercial built bodies for many cars including the Ford. My observations on your new T aren't meant to be critical, just providing an answer to your first post on identifying the body. 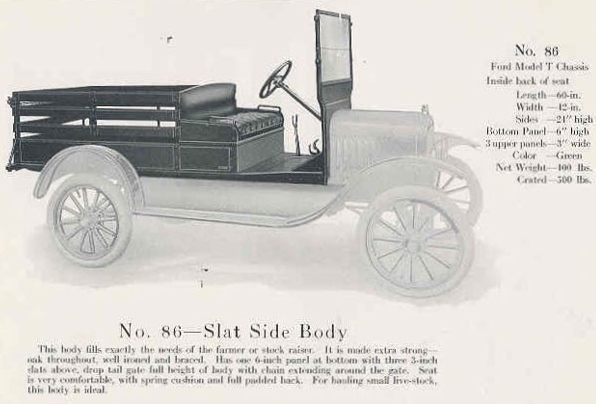 Back in the period, Ford sold hundreds of thousands of bare chassis, and commercial builders would make bodies to fit on the chassis. So the comments that your T has a Ford cowl, which is only part of the Ford body, I assume it was used in construction. Typical bodies would have their own dashboard without using Ford body parts. Have fun putting the T back together and making for an enjoyable adventure! Great info. That makes sense. thank you. David -- Fords made in Oct. of '22 are '23 model year cars. They often were titled in the calendar year they were sold, leading to much confusion today. The lip on the front fenders didn't start until the '24 model year. 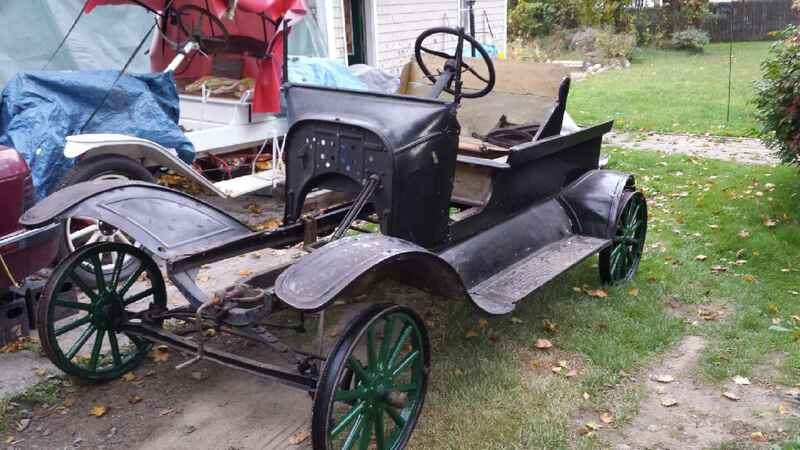 I'm thinking that someone took a very-well used '23 Touring or Runabout and cut off the back part of the body, then mated it to the wood body that's on it now. That probably would have occurred when the car was several years old. It was quite common for Runabouts and cut-off Tourings to be converted to Pickups when they were no longer needed to transport people. 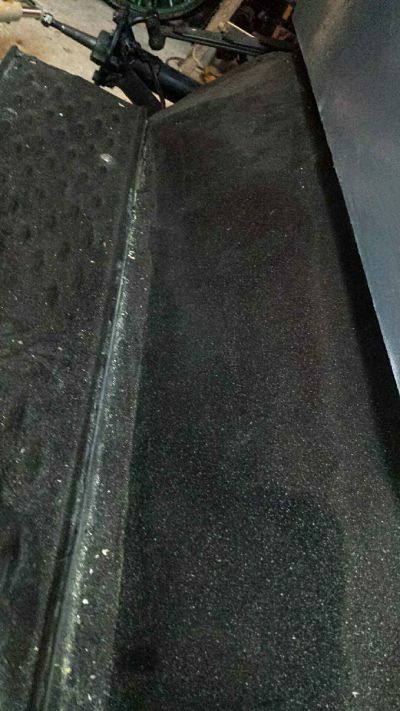 One thing which doesn't quite fit this scenario is that the splash shield (the part between the running board and the body) has a "crease" about a foot in front of the rear end of it. Those shields were used through the 1916 model year, but not later. If the original shield on that well-used car were pretty beaten up at the time the transition to the Pickup body was made, whoever was doing the work might have replaced that part with one on hand, regardless of the year of the part. It would fit fine, and serve just fine for a working vehicle. I'm curious to know whether the splash shield on the opposite side has that crease. These are better photos of the splash shields. Both quite banged up. A lot of "trucks" were created from cars during WW II. My grandfather told me he turned his T into a pickup because he could get a different gas ration stamp that allowed him more gas. David here is my 22 touring cutoff. It has been in the family since new. They cut the back of the touring car off in the early 30's so they could use it around the family farm to do chores. It was parked on blocks in a woodshed in 42 because of the war.